Hereâs a different tattoo-story you may like to read. The cult of tattooing traces a long history back into the cells of the prisons all over the world and these have a sinister version of their own. Prison tattoos have often had exclusive lingo communicating codes that speak the stories of the inmates in the prison. At times they serve as badges or codes that state the sentence or the cause for which the prisoners are serving. Itâs quite intriguing to trace the details of a few of these like the famed Mexican and Columbian Prison Tattoos (famed for all the wrong reasons) consisted of flamboyant calligraphy spelling the names of some of the most vicious mafias. 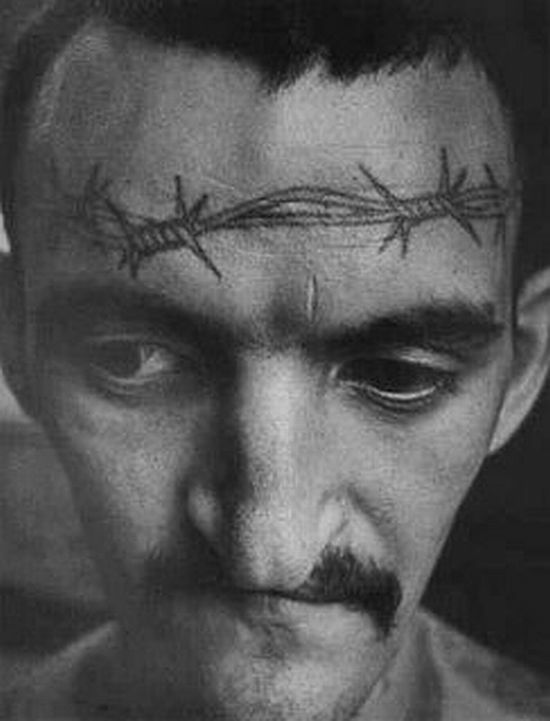 A very common tattoo inside the prison-walls is the barbed wire tattoo that indicates a life sentence or a skull that says the man is a murderer. The Russian Prison Tattoos went one step further and stood for the rank and position relevant to each prisoner within the prison system. Donât you think itâs simply amazing that Prison Tattoos articulate an obscure language thereby consolidating the identity of a few unfortunate ones who have lost their identity in the outside world? Thank God that this practice is beginning to gain an acclamation accompanied with secure tattooing norms and disease prevention assurance, as at least that way the inmates will be able to retain some individuality along with a means of self entertainment as well. What if it seems a little weird, it has been a long-prevalent practice among the prisoners for eons. ← All in a tattoo’s name!